Athlete uses the same leg design as Oscar Pistorius, the bi-amputee runner with carbon fiber feet who was denied entry to the Olympic games because his artificial lower limbs gave him an unfair advantage over able-bodied human runners. Robots, even the most impressive and scary among the recent crop, don’t tend to move in ways similar to living things. 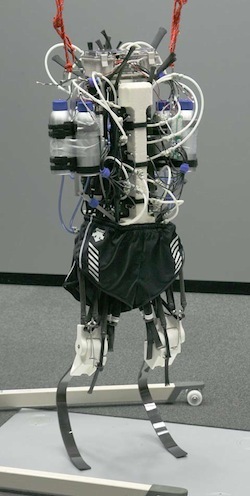 Except for Athlete, a running bot with leg movements so human it’ll give you chills. The secret to Athlete is that unlike most every other android out there which uses rotational-joints driven by motors to drive its limbs, Athlete uses air-motors that mimic human muscles. And when we say mimic, we really mean mimic–right down to the muscle pairs in human legs, with roughly the same range of motion. The air motors are also proportional, rather than on-off, so they have a degree of control over the robot’s legs that’s very close to the way your muscles contract to swing your legs around. The robot, built at Tokyo University and recently demoed at the 2010 International Conference on Humanoid Robots, has already been through a number of iterations as the research team perfected different aspects of the biomimicry. But the latest design will remind you of a real person: Oscar Pistorius. He’s the bi-amputee runner with carbon fiber feet who was denied entry to the Olympic games because his artificial lower limbs gave him an unfair advantage over able-bodied human runners. Athlete uses the same leg design. And there’s more human-copying here too, since the robot’s gait has been learned by copying real human leg motions while running. Check out Athlete in the summary video below, which shows the bipedal chap jumping, running and falling over. The falling over thing is explained by the team as an issue with the speed of processing input from the robot’s sensors–he can maintain a steady gait for only a couple of steps before the feedback from the ground is lost, and he tumbles. But they’re confident with some tweaks the robot will be able to achieve a stable gait. He’s convincing, and has a clever gait that involves “trusting” his feet will reach the ground between steps, rather than calculating the precise positions of everything. Closer yet is Boston Dynamic’s Petman, which also has a human-like gait but lacks the subtleties of Athlete’s design. This new robot convinces us that in the future, the kind of robot we’ve seen in countless sci-fi movies–particularly Will Smith’s version of Asimov’s I, Robot, really is a possibility in just a handful of years.